The proposed drilling site is near the Trans-Antarctic Mountains in eastern Antarctica. Imagine an unbroken chronological record, dating back a million years, of temperature and atmospheric conditions on Earth. Such a thing could indeed exist in the form of an ancient and undisturbed Antarctic ice core, according to a recent survey. Ice cores are like a window to the past, allowing scientists to observe and document climatic and environmental changes over long time scales. Continuous ice cores, in which the stratigraphic layers are undisturbed, are particularly valuable, as they provide an uninterrupted chronological record of our planet’s history. By analyzing ice cores, scientists can determine what temperatures and atmospheric conditions were like in the past, among other environmental measures. The current record for a continuous ice core is 800,000 years, which was found by drilling a core into 10,725 feet (3,270 meters) of ice at a site called Dome C in East Antarctica. But as a new paper published in Geophysical Research Letters shows, an even older continuous core may exist deep within the Allan Hills Blue Ice Area in East Antarctica—one that could contain a complete Antarctic climate record over the past one million years. This windy, desert-like region is located near the Trans-Antarctic Mountains, and it gets less than a centimeter of snow accumulation each year. Here, the ice moves very slowly, shifting less than three feet (one meter) every year. This site had been rejected in the past as a candidate for continuous ice cores, because the base of the ice sheet—where it meets the bedrock—appeared to be disturbed. New data collected by researchers from the University of Washington and the University of Maine suggests this assumption was wrong, and that an extensive, unbroken chain of icy stratigraphy lies below. Laura Kehrl, a UW doctoral student in Earth and space sciences and a co-author of the new study, was inspired to investigate the remote region owing to the recent discovery of 2.7-million-year-old ice at the Allan Hills area. These samples are very old, but they came from disrupted stratigraphic layers. Working 6,400 feet above sea level and using ice-penetrating radar, Kehrl’s team was able to map the internal stratigraphy, density, and age of the ice field. With computer models of glacial flow, they estimate that one-million-year-old ice resides about three miles (five km) from where the 2.7-million-year-old ice was found. Armed with these findings, the researchers have submitted a drilling proposal to the National Science Foundation. 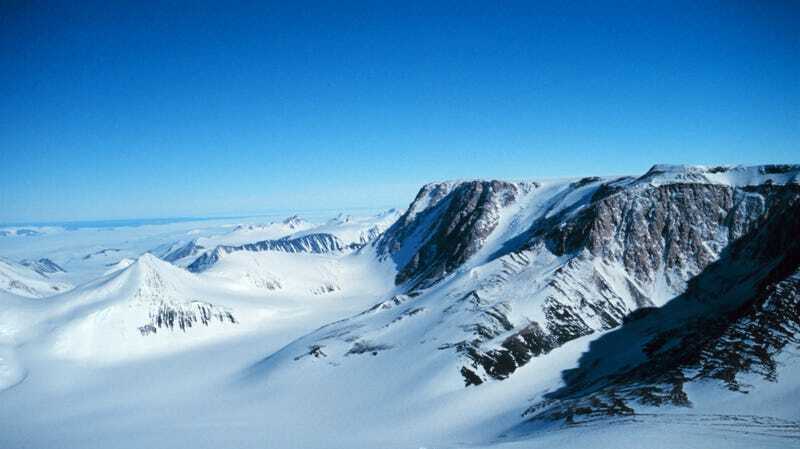 Left: The Allan Hills Blue Ice Area in Antarctica, showing the 2.7-million-year old ice and the proposed drilling site. The black line marks the track of the radar profile on the other panel. Right: Radar reflections from layers with different chemistry. The red dashed lines show two layers of volcanic ash deposits of known age. The black dashed line is the proposed core site. Should the researchers strike geological gold, the extended ice core could solve some vexing scientific problems. For example, the Earth used to experience ice age cycles once every 41,000 years or so. But then, about a million years ago, the cycle switched to once every 100,000 years. Scientists aren’t entirely sure why this happened, but a million-year-old core sample may contain some clues. The ice core could also tell scientists if the Ross Ice Shelf collapsed in the past, and if the event altered the amount of carbon dioxide in the atmosphere. And of course, the core could provide a continuous record of carbon dioxide levels and other atmospheric markers dating back one million years. Fingers are seriously crossed that Kehrl and company will return to the Allan Hills Blue Ice Area, but this time armed with a very long drill.